Outside the house there’s a shushing; a faint rushing, distant, easy to miss. But it’s an invitation. 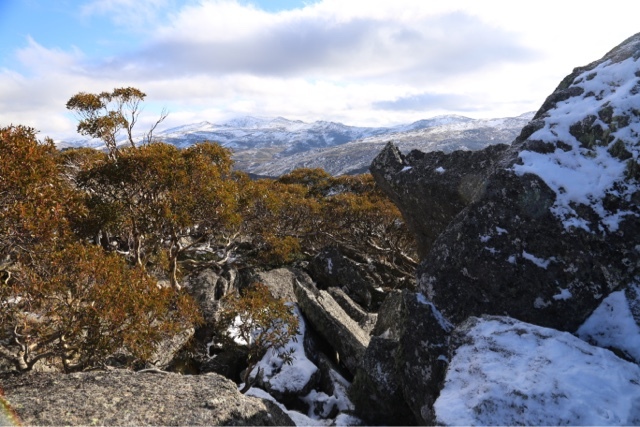 We’re staying to the east of Jindabyne in the Snowy Mountains, at my brother-in-law’s property. The house sits in bushy hills high above the Snowy River, but in still weather the small, enticing sound of its fast-moving waters reaches the house. A couple of days later we’re walking down the steep farm tracks that should eventually lead us to the river. It’s a crisp, blue-skied winter’s day. We’re happy to meander along the tracks, following the loose, thumb-nail kinds of directions you get from locals. Occasionally we spook kangaroos – tall eastern greys – that silently lope away, more out of caution than fear. But when we surprise a single sulphur-crested cockatoo, it shreds the sky with wails fit to wake the dead. As we descend we gain glimpses of the snow-covered ranges that give the region its name. Despite the cold, there’s little ski-able snow as yet. What has fallen has largely melted, adding to the roar of the river’s waters. We’re hearing that sound clearly now, like a constant gale blowing through trees, except there’s not a breath of wind. Tyre tracks diminish as the track steepens, replaced by ‘roo, wombat and other animal prints. Something cloven-hoofed has come this way too, deer perhaps, or goats. It’s now steep enough for mountain goats. We use our trekking poles to help us down, both thinking ruefully that we’ll be climbing back this way. 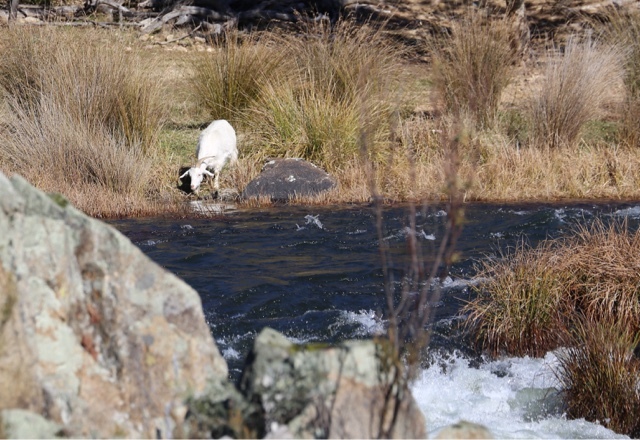 The Snowy River gained fame through A.B. “Banjo” Paterson’s 1890 poem, “The Man From Snowy River”. 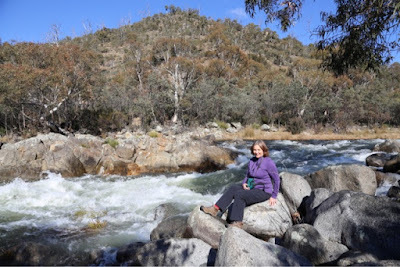 Two states, Victoria and New South Wales, share the river, and both vie for the right to claim the legend as their own. It’s a rare thing for Australians to engage with poetry, so perhaps the tussle isn’t such a bad thing. Less helpful is the "wild bush brumby" legend derived from the same poem. Wild horses, and the persistent advocacy for their presence in these ranges, has caused a great deal of environmental damage here. Cloven hooves and thin, slow-to-develop soils, don't mix well. Goats, horses, deer - all hard-hoofed and feral here - do far more damage to soil and vegetation than the soft-footed kangaroos and wallabies. Upstream of where we are the river is involved in another legend, the Snowy Mountains Scheme. This massive hydro-electric and irrigation scheme, begun in 1949, comprises sixteen dams and several power stations. The Snowy River is one of the rivers whose waters are used and re-used in the scheme. 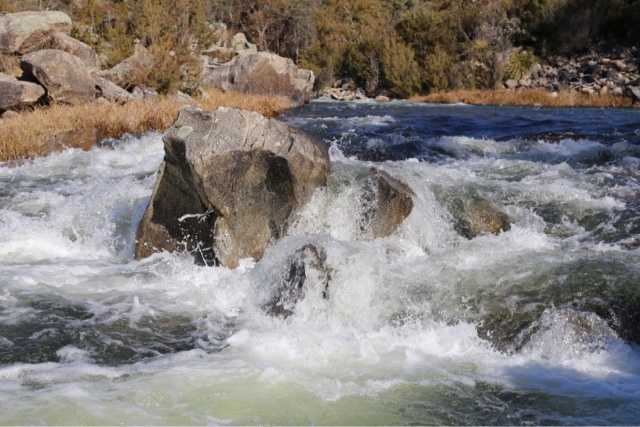 Its flow is strong and turbulent as we clamber down to its banks. Frost lingers where the slanted sun can’t reach, and we’re cautious climbing over the lichen-encrusted granite cobbles. As the river roars, we find a sunny spot to have lunch. We have two small thermoses of soup, and a little bread. But we’ve forgotten our mugs, so have to take it in turns to sip soup from the tiny demitasse lid. We decide we’re part of the slow food movement, and gladly so here, now: with the sky a deep blue and the snow-fed waters tumbling and chuckling around us. As we eat we spy a snowy-coloured goat grazing its way down the opposite slope. It moves slowly, unconcernedly, now in sight, now hidden behind bushes. At this distance, perhaps 400 metres, it could be mistaken for an animated snow-gum, angling downslope in search of water. Towards the end of our slow lunch it gets there, stopping to take a few sips of the snow-chilled water, before ambling off through the stream-side scrub. We move off too, though our steep route doesn’t allow for ambling. Instead we shorten our poles, put our heads down, and trudge back up the way we’d come. We’re almost pleasantly surprised at how quickly two legs and a bit of will can gain altitude, and we say as much to each other - once we regain our breath.